April 2015 proudly showing off just a few of our 100 new Going Home Book Bags. 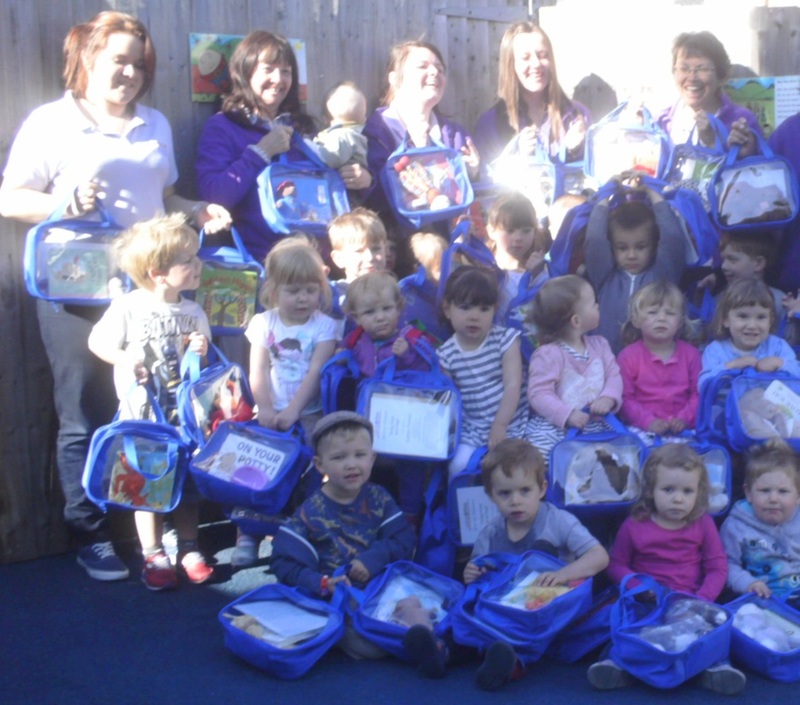 In March 2015 Grafton Childcare was very grateful to receive a grant from Devon County Council of £395.48 which we have put towards the purchase of a set of 125 different Going Home Book Bags at a total cost of over £1,800. Since then we have added an additional 75 Book Bags, bringing our total to 200. These will support Grafton Childcare in further developing our strong links with parents, our new Going Home Book Bags we hope will help Grafton Childcare to establish a highly practical and easy to manage family lending library here at Grafton Childcare. As any visit to the library, WHSmith, Waterstones, or even the supermarket, will tell you - there are so many wonderful storybooks to enjoy. Igniting and sustaining a love of books is such an important responsibility for early years practitioners…and if we have the added bonus of parents continuing that at home, then so much the better. At Grafton Childcare we are always keen to develop links with parents in order to support home learning. To promote an early love of books, we have established our very own and very unique family lending library - lovely but sturdy little bags, each with a storybook and a soft toy, puppet or toy that the children will enjoy sharing with you at home. Ideally we would like parents and carers to take a book out on loan for a minimum of two days, so that that they have the opportunity to read the book with their child at least twice. But they may keep the book for up to a week if they would like to. By looking at books, reading stories together, singing rhymes and songs, children will begin to develop a love of books. By talking about books, illustrations and characters, children will hear and use new vocabulary. Sharing and talking about stories and rhymes also encourages children to express their ideas, thoughts and emotions. This all helps to develop their empathy and understanding - a really important part of growing up and being able to communicate and socialise with others. Talk - lots! Talking with your child increases their vocabulary and helps to develop their curiosity and imagination. Taking time to talk with your child is so important - listening to talk on the TV isn’t quite the same. Role model reading. You don’t always have to read to your child - just by showing that you enjoy reading will help. And that reading can be anything - magazines, newspaper, your Kindle…even the cereal packet! For boys, it’s particularly important that dads show they read too - your messages on Facebook, your emails or the Sunday newspaper are fine - just show you are reading. Read aloud to your child - as often as possible. A bedtime story is a popular time to read to your child, but it can be at any time. Even making up a story as you are walking to the shops, or driving in the car - the sillier, the better! Have books on show at home. Access to as much reading material as possible is key. Use the library and charity shops - books don’t have to be brand new. And of course, please use our Grafton Childcare family lending library of “Going Home Book Bags”, as often as you wish! We have given each child a very simple record of all of the current books, soft toys, puppets and toys in our current collection. It is a very simple system, parents, carers and your child select the book our “Going Home Book Bags” collection, that you would like to take home. Ideally we would like parents and carers to take a book out on loan for a minimum of two days, so that you have the opportunity to read the book with your child at least twice. But you may keep the book for up to a week if you would like to. A sample "Going Home Book Bags" reading record is attached here for you to take a sneaky preview. We have listed the books in no particular order, next to each title is a space where your child’s Key Worker can note the date you took a particular “Going Home Book Bag” home and another space where we can note when it was returned. We will also keep a master record here at Grafton Childcare, just incase you should loose your reading record, but we hope you will look after it because, when you have read 25, 50, 75, 100, 125, 150, 175 and 200 of the books in our family lending library, your child will be presented with a certificate and book as a mark of their achievement.